Understated mens Skagen watch in stainless steel. This sleek time piece is set around a stylish black dial with silver baton hour markers and slender silver hands. It is fitted with a black genuine leather strap, 30 metres water resistant and powered by a quality quartz movement. 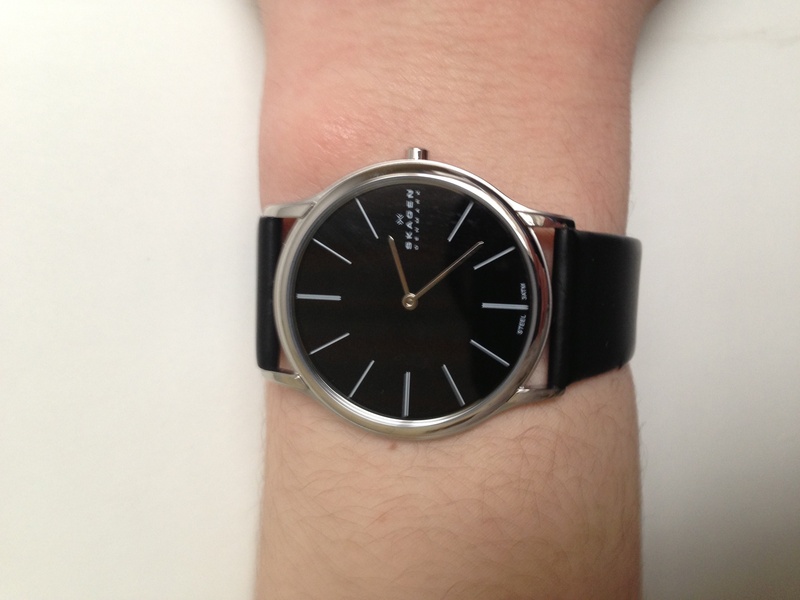 I purchased a Skagen watch off the watch shop website a couple of years ago for my boyfriend who loved the watch so much he wore it constantly until the strap sadly broke and he lost it. 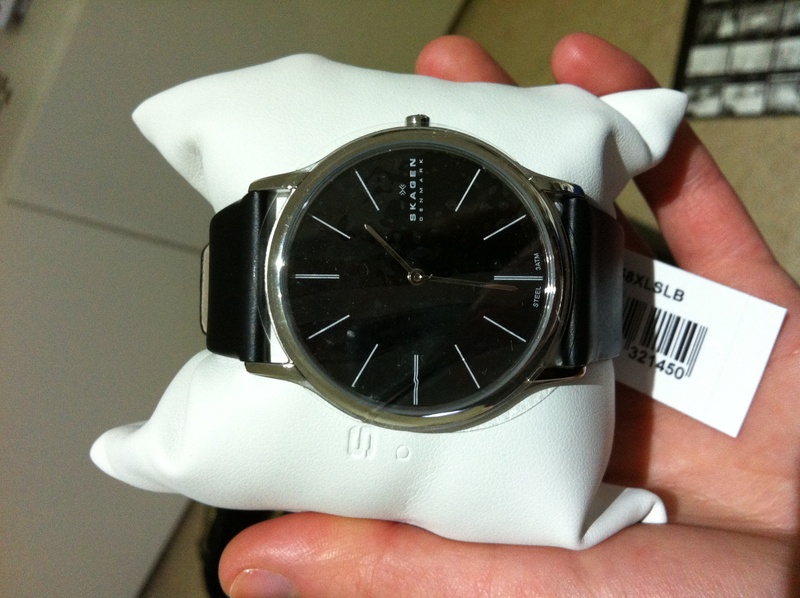 I have just purchased another Skagen watch for him, for his birthday and he loved it! So Im very pleased!! 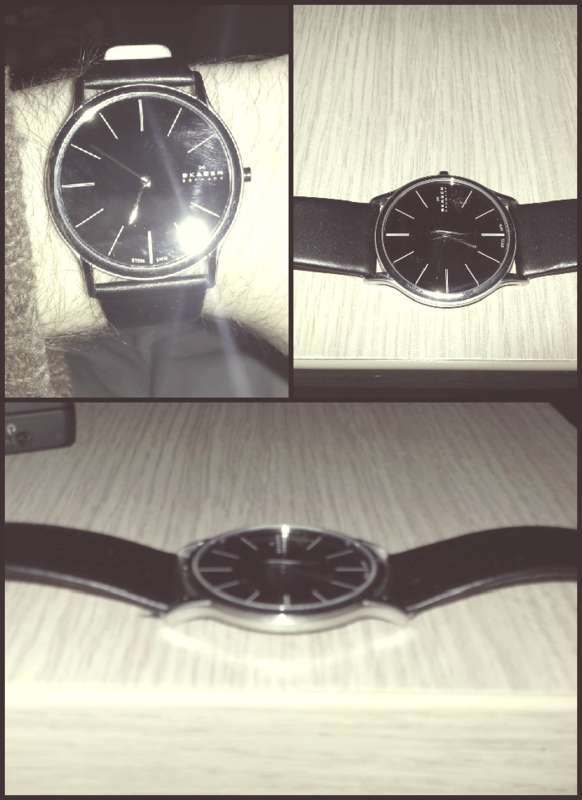 What a lovely watch, lovely and thin for the man who doesnt like big chunky watches. Since the day this watch for my husband arrived he hasnt taken it off. Brilliant thank you. Great watch, bought as a present for a friend and he loves it. Really slim and smart looking! I had however seen a selection of other Skagen watches at an airport and was impressed so looked through the Watchshop collection. Pleased that I chose it. Love the watches and the free delivery came the very next day, great service. 18th Birthday Present for Son - He loved this, he is studying architecture and is quite fussy about design, so this ticked all the boxes. Delivered quickly and in time to his residences other supplier we had originally ordered from couldnt guarantee delivery. I would recommend this product and the Watch Shop. Excellent watch,no thrills,just looks smart and masculine good buy. 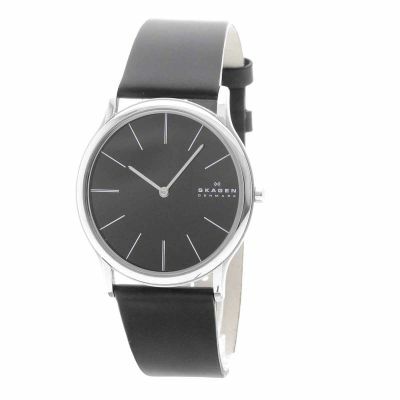 Skagen realy have got it right. The watch looks very professional and understated. Goes great with a suit or smart casual. I had a Skagen watch years ago and when I needed a new one I decided to go for Skagen as I love the slim design and comfort. Bought this watch for a leaving present for a member of staff. He was extremely pleased with the watch as it looked more expensive than it was is elegant and timeless. Very happy with my purchase. Very convenient to collect the product from local Goldsmiths store, the next day for free. Nice watch..ultra slim...and very fast delivery. The watch looks good, too bad it arrived in a non working condition. The box has no seal or it has been removed so there is no way to know if it was previously opened or not. Also there was no safety feature at the crown and it was pushed all the way in, so probably the battery is gone. There is no way to know for sure though, as the watch is not working. Watch arrived swiftly and safely in good packaging. Watch is lovely - just as elegant and classic as pictured. Fantastic watch, understated and very elegant, keeps excellent time. A real bargain. The simple face and slim case make this a beautiful sleek gents watch. Elegant and smart without being over elaborate. Very happy with it. Bought as a birthday present, ordered late on a thursday evening arrived on the saturday morning very stylish and attractive. My husband doesn t like anything too fussy and this was just perfect for him. Would recommend for choice and for excellent level of service. Amazingly thin watch. Almost feels like youre not wearing it! Clean design, minimalist which I like. Nice box to store it in. Despite its thin designer feels well made and robust. Ideal dress watch or for everyday. Very pleased with the watch. It was a Christmas presant for my son. He has this model befour and loved it, He is a teacher and likes the light ans classic model.He has had comments on it. Excellent design .Good time keeper .The black dial is very stylish.Would recommend to anyone who wants a goog quality watch. Classic face minimalist design lovely watch, maybe a little big for my small wrist but I can cope with it. A beautiful watch, slim, light and functional. I have been looking for one like this for ages, Excellent price too. Great looking watch with a quality feel for its price. Good sized strap, and comfortable to wear. I bought it for my boyfriend and hes never worn watches before, so I wanted something minimalist and easy to wear, which is exactly what it is and suits him really well, the face itself is very thin and smart and clear to see: You cant go wrong with this one. 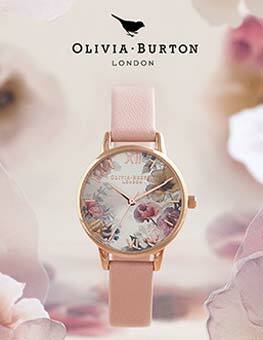 In a world where watches are getting bigger and the faces more cluttered, this watch is the perfect antidote. Clean, simple, and the perfect accessory for the smartest of looks. £20 cheaper than in Samuels shop. Looks fine. Just made sure it was working as its an Xmas present. This watch is beautifully elegant, simple and classic - looks good with anything. Its very slim so feels light on the wrist. The build quality is high, and it looks and feels like a much more expensive product. Recommended! Very pleased with the appearance, style and dimensions of the watch. Meets all of my expectations of what I think a dress or fashion watch should be. It will be primarily used when dressing up for dinners, special occasions and so on, as opposed to daily use. Stylish, uncomplicated watch less is more slim design with a very good quality leather strap. It has a touch of class without breaking the bank. Delighted with my purchase. I liked this watch for the simple reason that it was a slim watch ,a nice comfortable fit, and no extra knobs or dials on the watch face. liked the watch as soon as i opened the box. really slim and comfortable to wear . i dont miss a second hand at all ,have no reason to need it. the watch face is simple and classy . This watch was bought as a gift for my boyfriend who is rather picky about certain styles and types of watch. When the watch arrived I was really pleasantly surprised as to how thin and sleek it is. This watch screams class and sophistication but without the heavy price tag. The chrome detailing is lovely and the lack of number markers is no problem at all as this only further contributes to the elegance of the watch. The supple leather strap is comfortable to wear and soft on the skin. If youre anything like captain hook and any ticking noise is unbearable then this is absolutely ideal, I have never heard such a quiet noise, therefore you should be safe during any visits to neverland! An all round gorgeous watch that would be ideal for both formal and casual attire and therefore great if youre looking for an everyday watch - the perfect gift! The watch was for a 21st birthday present. Fantastic ordered, delivered within the time scale. The person who it was for choose it and was really pleased with it when it arrived. Will use this site and will recommend it to other people. Bought as a gift for my girlfriend, she loves how light and slim the watch is. She say she can easily forget she is wearing it is that comfortable. 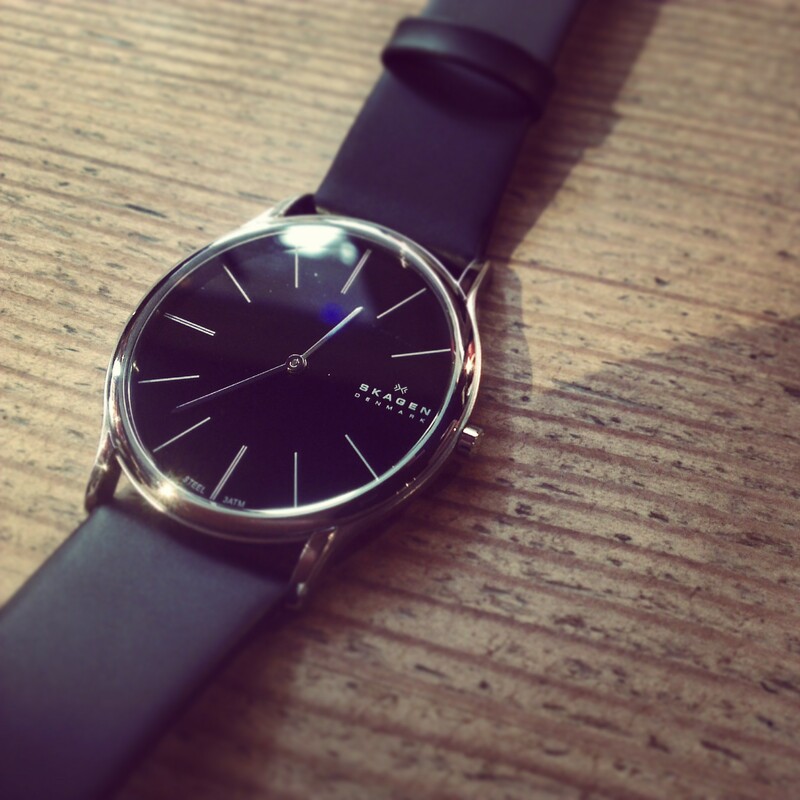 I wanted a a slim watch with a plain face and the Skagen classic gave me all I wanted. There is no date, no month, no second hand, just what I wanted. Brilliant!! I have bought this as part of my husbands Christmas. I had not heard of the make before but I really liked to look of the watch - the face and the slimness of the watch I really like as. I personally dont like chunky watches. Very classy looking. Bought for my husbands birthday. He is thrilled with it. Very stylish and elegant for a mans watch, would definitely recommend it, nothing negative to say about it. I bought this watch for my boyfriend. He loves simple and minimalistic designs and this is just perfect. The watch is absolutely beautiful with a fantastic, sleek design and looks very stylish on. The watch face itself isnt too big, its not chunky and doesnt catch on clothing etc so it would fit all occasions - evening or day wear. This watch is so elegant, technological, classic, classy, sober and the price is definitely honest and worth it. Whether I would pay more for that, not sure. But I bought it because it was the nicest withing its price range £70-£100. A really elegant watch with none of those silly dials that no-one ever uses. If you like to be bling-free then this is the watch for you. I fell in love with the watch when I first tried it on at a shop, but did not make a purchase as I am not a person who would wear watches regularly. However, the thought of getting this watch remained on my mind for a few days. So, I decided to check online and finally made my purchase through the Watch Shop. I like the simple yet elegant look of the watch. The leather strap looks fine and is comfortable on the wrist. The lack of the seconds-hand does not even matter at all, in fact this makes the whole appearance of the watch look more classy. The only thing I dislike about the watch is the fact that it does not show the date. If it does, it would have been perfect. Nonetheless, I am very satisfied with this watch. For a person who has not worn a watch for five years, you ought to know how much I love this watch. At first I didnt like it coz Im of slim build so the watched looked about big on me but after a couple days I just fell in love with it. Its very classic , thin and lightweight . Id recommend it to anyone looking for a beautiful classic watch!! Very pleased with my purchase. Thank you Watch shop! Simple, elegant and understated classic design. Incredibly lightweight and 6mm depth makes it a great watch for all occasions, in particular wearing with cuff link shirts at work. I dont miss having a seconds hand or date on the watch, in fact I really like the fact the face its not cluttered with many words or additional features. Leather strap very comfortable and face fits well on wrist. Speedy delivery - from order to wrist in less than 48 hours! If you are looking for a classic watch at a great price, and like to keep things simple and understated - buy this watch! A sleek elegant watch. Love the thin face and uncluttered look. Simple black leather strap. Only negative point that was not noticed till acquired was the lack of a second hand but by them the new owner had fallen in love with the watch. Fine looking, elegant watch with a nice strap. A very pleasant change from all the macho, gizmo laden, bells and whistles jobs. This special watch. For me it is. At first I was concerned about the lack of a second arrow. Now I understand how its convenient. Watch look more calm, because there is no significant moving parts. This does not mean that the clock died. The first time I looked at it the fear. But no, they go. Well go. And do not hear the ticking of the second arrow, because it is not there. Against the black dial, readable indications of time. Clock size clearly indicates that they are mans character, despite the relatively modest size. Thickness of 6 mm, and this had a positive effect on weight. Hours hardly felt on the hand, but you know they are with you. Steel case succinctly frames the dial and gives the whole design reliability and elegance. Separately, I note leather strap. Genuine leather black and a good dressing is nice to touch. They blend in with the black dial. 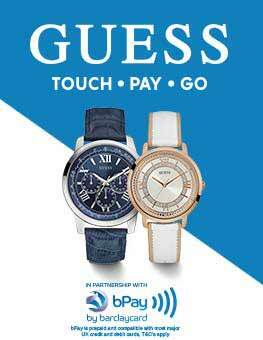 SKAGEN successfully put your logo on the dial. Hes not very stands out, and at the same time gives some flavor through hours non-standard locations. The combination of two colors - black and steel, does not attract too much attention. Great mens watch for business people. In a nutshell - functional, practical, reliable and precise, quiet and tasteful. 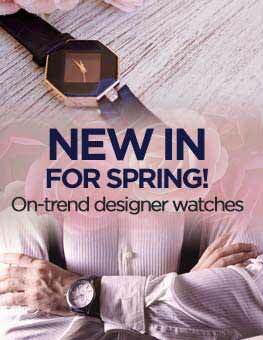 If you want to have an elegant mens watch in good taste - you have made the right choice. As for me, I got what I expected. I loved it. The desing of this watch is amazing. It is very light and comfortable. A must-have! Im not a big watch wearer, as I dont like chunky things hanging off my wrist. I bought this one as it looked a little lighter than some others. The watch is light and thin with a very sleek design. I wasnt sure about the black face but when it arrived I thought it looked very smart. Great for casual wear as well as more formal wear. Definitely recommend this watch. The watch was exactly as advertised and would have been perfect for my husbands birthday present if he had not found the one he thought hed lost the very day before I was due to give it to him! I bought this watch as a present for my son and he is delighted with it. Thank you for excellent service. This is my second Skagen watch after having lost my first one. I like this one even more. It is incredibly slim and simply elegant. I bought this for my husband and it looks amazing. Smart and sophisicated watch which is very thin. I would recommend it to anyone. Really slim and exelent quality. 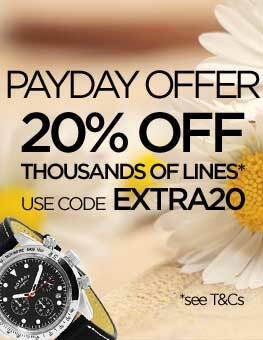 Great service from watch store would highly reccomend them. The watch is superb. Obviously a great time keeper but the main reasons for the purchase were the make and thickness. Skagen are well known for quality but you will need to go a long way to find another watch that measures just 6 mm in thickness. The black face and silver details give easy viewing and the strap is the softest leather I have ever encoutered on a watch. there are no points that make this a purchase to criticise. Lovely, smart looking, good size face and nice and slim. Good for wearing for that special occasion and not too detailed as to look cluttered. Very slim and elegant design. Genuine leather strap. Fits perfectly on my wrist and has a very nice look! Suitable for all-day occasions and definitely a good buy for its price. The colour is exactly as pictured. It seems durable and of good quality. It is also very light and not at all annoying when wearing it. Also the dial has a good size analogy to the strap. Silver casing; very slim; fair size in diameter; black background; simple one notation design for marking the hours; black leather strap. Very stylish, graceful and elegant watch. 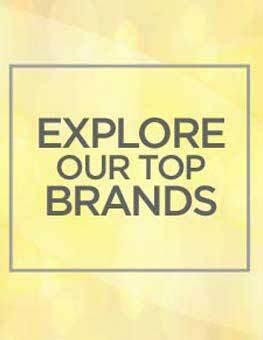 Would have preferred manufacturers logo to be in the top centre rather than at the 3 position, but that is a very minor quibble. Watch is waterproof but the leather straps arent so water friendly. They take time to dry if got wet.